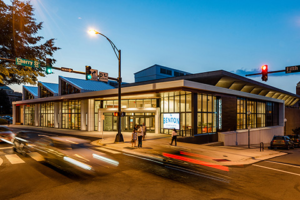 WISE 2019 will be held at the Benton Convention Center in the heart of Winston-Salem, and conveniently located across from the Marriott Hotel Winston-Salem and the Embassy Suites. Having recently undergone a $20 million reinvention, the Benton (301 W 5th St, Winston-Salem, NC) offers beautiful amenities and is situated near numerous restaurants, performing arts centers, museums, and historic Old Salem. Part of Interstate Business 40 through downtown Winston-Salem will be closed during WISE Conference. The NC Department of Transportation has partnered with WAZE to share real-time traffic information and advises drivers to use the WAZE app. We recommend downloading the app before you leave for WISE 2019 to help you better navigate the area. Visit this website for further information. To assist with your travel, listed below you will find specific directions to our conference location using different methods of transportation. Email any travel related questions to wiseconference@nullwfu.edu. Winston-Salem is served primarily by the Piedmont Triad International Airport (GSO) in Greensboro, NC. Commercial airlines serving the Piedmont Triad Airport include American Airlines, Delta, United Airlines, USAirways and Allegiant Air. Taxis and rental cars are available, and express shuttle service is operated by PART from the PTI Airport to each major city in the Piedmont Triad. The fare for PART is $2.40 for adults and transfers are free. You can visit www.visitwinstonsalem.com or the WFU Visitors’ Center for more information on cabs, limousine services, shuttles and rates. Charlotte Douglas International Airport (CLT) is approximately a 90-minute drive to Winston-Salem. Information on transportation to Winston-Salem from CLT can be found at the airport website or you may want to check out a company called “Official Shuttle” with transfers to Winston-Salem. Raleigh/Durham International Airport (RDU) is also about a 90-minute drive away. Information on transportation to Winston-Salem from RDU can be found at the airport website. The Smith Reynolds Airport in Winston-Salem is available to charter and private aircraft as well as some commuter flights. NOTE: Part of Interstate Business 40 through downtown Winston-Salem will be closed for major repairs during WISE Conference. Please read alert at the top of this page. Take I-95 south to I-85 south, then west on I-40 toward Winston-Salem. Merge right onto Business I-40 / US 421 N and follow it into Winston-Salem. Take Exit 5C (Cherry Street) north toward the Convention Center. Drive about five blocks to 301 W. 5th Street. Take I-77 north to I-40, then take I-40 east toward Winston-Salem. Merge left onto Business I-40 / US 421 S toward Winston-Salem. Take Exit 5C (Cherry Street), bend slight left along High Street for two blocks, then turn left on Cherry St toward the Convention Center. Drive about five blocks to 301 W. 5th Street. Take I-40 west toward Winston-Salem. Merge right onto Business I-40 / US 421 N and follow it into Winston-Salem. Take Exit 5C (Cherry Street) north toward the Convention Center. Drive about five blocks to 301 W. 5th Street. Take I-40 east toward Winston-Salem. Merge left onto Business I-40 / US 421 S toward Winston-Salem. Take Exit 5C (Cherry Street), bend slight left along High Street for two blocks, then turn left on Cherry St toward the Convention Center. Drive about five blocks to 301 W. 5th Street. The Cherry/Marshall Streets Parking Deck is located next to the Embassy Suites and directly across from the Marriott, and has entrances on Cherry Street (one way northbound) and Marshall Street (one way southbound). The garage connects to the Embassy Suites as well as the Marriott Hotel via an enclosed skybridge. An underground, climate-controlled passageway connects the Embassy Suites to the Benton Convention Center. This garage is for self-parking and available for $1/hour or $15/day. Valet parking is also available at the Marriott for $18/day. An additional parking garage is located one block north of the Marriott on the right hand side of Cherry Street (Sixth-Cherry/Trade Parking deck). This garage also connects to the Benton Convention Center. A downtown Winston-Salem parking map can be found here. the address for the Historic Brookstown Inn is 200 Brookstown Avenue, Winston-Salem, NC 27101.
the address for the Benton Convention Center is 301 W. 5th Street, Winston-Salem NC 27101. Amtrak provides rail service to Greensboro and the Piedmont Triad through its Carolinian route. For reservations, call 1-800-USA-RAIL. The Benton Convention Center is in close proximity to many top-ranked restaurants. If you want to explore the city’s dining options, see this list of WISE-2019-Downtown-Restaurants.